We have made the largest-volume measurement to date of the transition to large-scale homogeneity in the distribution of galaxies. We use the WiggleZ survey, a spectroscopic survey of over 200,000 blue galaxies in a cosmic volume of ~1 (Gpc/h)^3. A new method of defining the ‘homogeneity scale’ is presented, which is more robust than methods previously used in the literature, and which can be easily compared between different surveys. Due to the large cosmic depth of WiggleZ (up to z=1) we are able to make the first measurement of the transition to homogeneity over a range of cosmic epochs. The mean number of galaxies N(<r) in spheres of comoving radius r is proportional to r^3 within 1%, or equivalently the fractal dimension of the sample is within 1% of D_2=3, at radii larger than 71 \pm 8 Mpc/h at z~0.2, 70 \pm 5 Mpc/h at z~0.4, 81 \pm 5 Mpc/h at z~0.6, and 75 \pm 4 Mpc/h at z~0.8. We demonstrate the robustness of our results against selection function effects, using a LCDM N-body simulation and a suite of inhomogeneous fractal distributions. The results are in excellent agreement with both the LCDM N-body simulation and an analytical LCDM prediction. 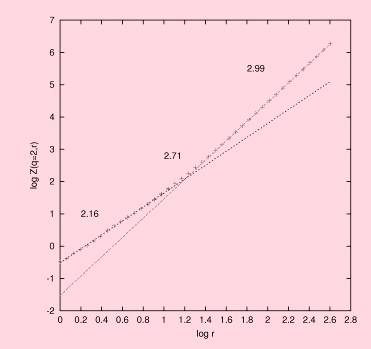 We can exclude a fractal distribution with fractal dimension below D_2=2.97 on scales from ~80 Mpc/h up to the largest scales probed by our measurement, ~300 Mpc/h, at 99.99% confidence. To paraphrase, the conclusion of this study is that while galaxies are strongly clustered on small scales – in a complex `cosmic web’ of clumps, knots, sheets and filaments – on sufficiently large scales, the Universe appears to be smooth. This is much like a bowl of porridge which contains many lumps, but (usually) none as large as the bowl it’s put in. Our standard cosmological model is based on the Cosmological Principle, which asserts that the Universe is, in a broad-brush sense, homogeneous (is the same in every place) and isotropic (looks the same in all directions). But the question that has troubled cosmologists for many years is what is meant by large scales? How broad does the broad brush have to be? The discussion of a fractal universe is one I’m overdue to return to. In my previous post I left the story as it stood about 15 years ago, and there have been numerous developments since then, not all of them consistent with each other. I will do a full “Part 2” to that post eventually, but in the mean time I’ll just comment that this particularly one does seem to be consistent with a Universe that possesses the property of large-scale homogeneity. If that conclusion survives the next generation of even larger galaxy redshift surveys then it will come as an immense relief to cosmologists. The reason for that is that the equations of general relativity are very hard to solve in cases where there isn’t a lot of symmetry; there are just too many equations to solve for a general solution to be obtained. If the cosmological principle applies, however, the equations simplify enormously (both in number and form) and we can get results we can work with on the back of an envelope. Small fluctuations about the smooth background solution can be handled (approximately but robustly) using a technique called perturbation theory. If the fluctuations are large, however, these methods don’t work. What we need to do instead is construct exact inhomogeneous model, and that is very very hard. It’s of course a different question as to why the Universe is so smooth on large scales, but as a working cosmologist the real importance of it being that way is that it makes our job so much easier than it would otherwise be. P.S. And I might add that the importance of the Scrimgeour et al paper to me personally is greatly amplified by the fact that it cites a number of my own articles on this theme! Dark Energy is Real. Really? I don’t have much time to post today after spending all morning in a meeting about Assuring a Quality Experience in the Graduate College and in between reading project reports this afternoon. However, I couldn’t resist a quickie just to draw your attention to a cosmology story that’s made it into the mass media, e.g. BBC Science. This concerns the recent publication of a couple of papers from the WiggleZ Dark Energy Survey which has used the Anglo-Australian Telescope. You can read a nice description of what WiggleZ (pronounced “Wiggle-Zee”) is all about here, but in essence it involves making two different sorts of measurements of how galaxies cluster in order to constrain the Universe’s geometry and dynamics. The first method is the “wiggle” bit, in that it depends on the imprint of baryon acoustic oscillations in the power-spectrum of galaxy clustering. The other involves analysing the peculiar motions of the galaxies by measuring the distortion of the clustering pattern introduced seen in redshift space; redshifts are usually denoted z in cosmology so that accounts for the “zee”. The paper describing the results from the former method can be found here, while the second technique is described there. This survey has been a major effort by an extensive team of astronomers: it has involved spectroscopic measurements of almost a quarter of a million galaxies, spread over 1000 square degrees on the sky, and has taken almost five years to complete. 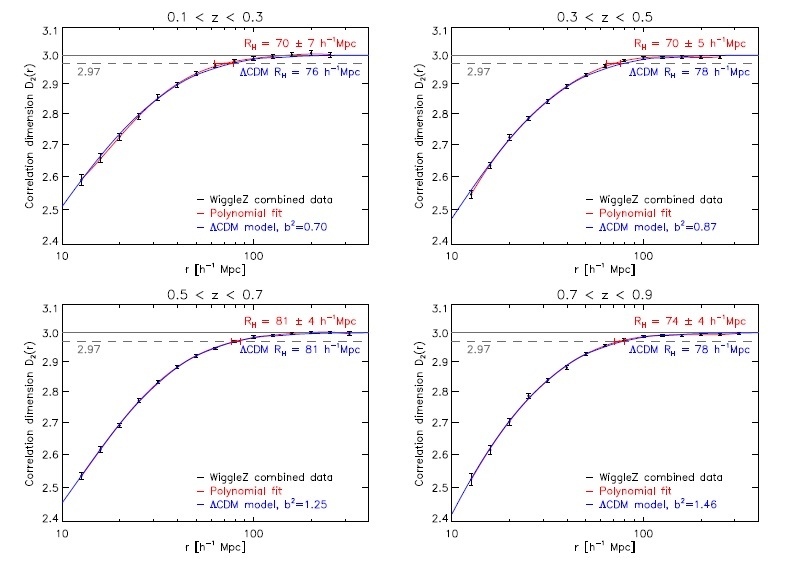 The results are consistent with the standard ΛCDM cosmological model, and in particular with the existence of the dark energy that this model implies, but which we don’t have a theoretical explanation for. This is all excellent stuff and it obviously lends further observational support to the standard model. However, I’m not sure I agree with the headline of press release put out by the WiggleZ team Dark Energy is Real. I certainly agree that dark energy is a plausible explanation for a host of relevant observations, but do we really know for sure that it is “real”? Can we really be sure that there is no other explanation? Wiggle Z has certainly produced evidence that’s sufficient to rule out some alternative models, but that’s not the same as proof. I worry when scientists speak like this, with what sounds like certainty, about things that are far from proven. Just because nobody has thought of an alternative explanation doesn’t mean that none exists. The problem is that a press release entitled “dark energy is real” is much more likely to be picked up by a newspaper radio or TV editor than one that says “dark energy remains best explanation”….